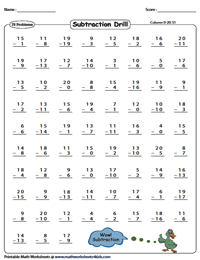 Nurture your child's interest in subtraction with this series of 0-20 drill worksheets. 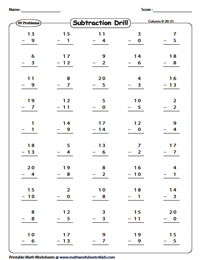 Subtraction problems vary from 15 to 100 problems per page in column and horizontal formats. Employ these worksheets for a quick review on evaluating a child's expertise in subtraction at home or in school. A number of free printable worksheets are also at your disposal. Suitable for grade 1 and up. Encourage your children to gain a better understanding of subtraction with this collection of 0 to 20 drill worksheets featured here. Each of the 6 worksheets comprises a total of 15 problems. 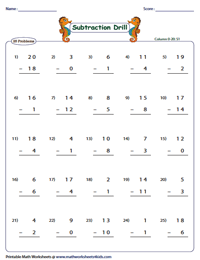 This array of subtraction worksheets will enhance the problem solving skills in limited time. Use the answer key to verify your solutions. Improve the speed and accuracy of students with this series of 0-20 subtraction drills. The worksheets are available in two formats, horizontal and vertical. 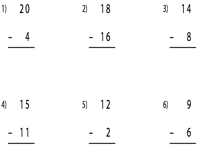 Challenge yourself to solve these 0 to 20 subtraction problems in 10 minutes. Each worksheet contains 75 problems. The drills are available in the column and horizontal format. This vast compilation of subtraction problems is sure to help 1st grade children gain proficiency in 0-20 subtraction. Set the timer on and start practicing the subtraction drills.